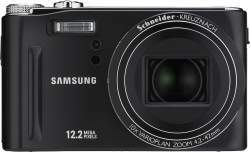 Samsung announced two new compact digital cameras today. One of them is called Samsung HZ15W and features a 12 megapixel sensor and a 24mm wide angle lens. The Samsung HZ15W camera will be available in March 2009 and cost about $330. RIDGEFIELD PARK, N.J. – February 23, 2009 – Samsung Electronics America today unveiled two new 12 mega-pixel compact digital cameras boasting 24mm ultra-wide angle Schneider lenses. Samsung’s new TL320 raises the bar for innovation in the digital imaging industry as it is the world’s first digital camera to feature a three-inch AMOLED screen with HVGA resolution. The new HZ15W, Samsung’s second mega-zoom, point-and-shoot digital camera, offers consumers one of the most powerful lenses on a compact point-and-shoot with an impressive focal length of 24-240mm (35mm film equivalent). The step up model from the HZ10W introduced in January at CES 2009, the 12 mega-pixel HZ15W offers consumers one of the most powerful lenses on a compact point-and-shoot digital camera, featuring a 24mm ultra-wide angle Schneider lens coupled with a generous 10x optical zoom. For blur-free images, especially when using the HZ15W at its maximum zoom, Samsung includes both Optical and Digital Image Stabilization. Optical Image Stabilization can be used independently or shooters can choose Dual Image Stabilization, which combines the strengths of Optical and Digital Image Stabilization. Like the HZ10W, the HZ15W puts high-definition video recording in the palm of users’ hands. With the HZ15W, consumers have the ability to record high-definition video at a resolution of 720p, and utilize the camera’s full 10x optical zoom. Samsung also incorporates H.264 compression and offers consumers true HDMI connectivity, which allows the camera to be connected directly to an HDTV without the need for a cradle. Additionally, the HZ15W’s ultra-clear, three-inch LCD screen is sure to turn heads and gives consumers the ability to easily frame their shots and review their images and video in any condition, even in direct sunlight. Designed for a range of consumers, including entry-level photographers and advanced amateurs, the HZ15W offers a variety of shooting modes, including Manual. The camera’s Manual shooting mode allows users to manually configure settings such as shutter speed, aperture, exposure, and ISO values. Similar to the TL320, the HZ15W also features a highly-intuitive suite of automatic controls designed to help improve one’s ability to take great digital images. The camera’s advanced automatic shooting options include Face Detection, Smile Shot, Blink Detection, Beauty Shot, as well as Smart Auto, which automatically selects the appropriate scene mode for the user, and Smart Album, which simplifies the process of searching for an image saved on a memory card. Available in black or silver, the TL320 will be available in May 2009 at an MSRP of $379.99.